Media literacy is more important than ever in a shifting media environment; this is especially true for undergraduate students, many of whom have little experience in learning how to locate, evaluate, and critically analyze the information they should be consuming about the world. A few startling statistics highlight this problem. Pew Research Center conducted a global survey about public trust in news media. When asked whether the news media are doing very/somewhat well at reporting political issues fairly, only 47% of Americans responded affirmatively. Only 56% of that same sample responded affirmatively when asked if news media are reporting news accurately. These numbers are not shockingly different from other countries like the UK or France, as well. It is not a far jump to conclude that this lack of trust has to do, at least in part, with media literacy—if news consumers are not educated on how to locate and critically analyze news sources, this could lead to a higher level of distrust in politically partisan or factually inaccurate reporting. Politically, this is an issue as well. In the first place, the use of false news stories to attempt to say voter behavior in the 2016 US elections is not just the matter of public debate; it is also central to legal investigations into Trump administration connections to Russia. In the second place, the expansion of internet media sources has exacerbated this issue simply through the ease of access and ease at which actors disseminate false information. While teaching my lecture series called “Introduction to Political Science” this past semester, one of my students told me (and others reaffirmed) that she gets most of her news from Snapchat. I am not an expert on Snapchat; perhaps Snapchat has great news coverage. However, it brought into class discussion the issue of how we might know that this coverage is legitimate and trustworthy. Many of us (rightfully) believe that the classroom is a place to teach students the most innovative research, arguments, and theories in our respective fields. 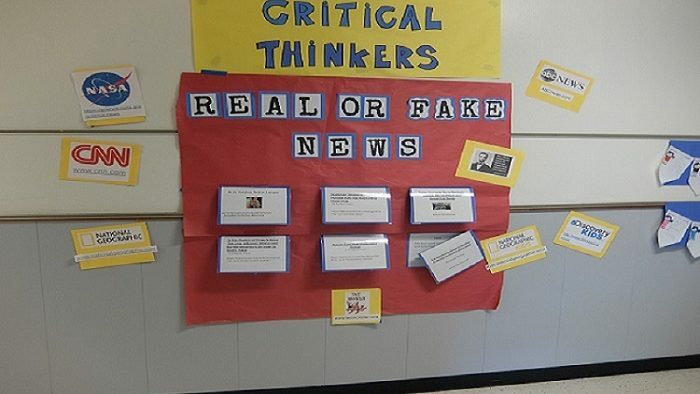 However, communicating news literacy to students is not antithetical to these concerns, nor is it outside the boundaries of instruction. If we want students to learn about the world, how it works, how structures and processes are connected, this requires students to engage with news media. It also, in another way, helps to develop broad-based analytic skills necessary for college-level study. 1. Integrate Current Event Assignments in the Classroom:Many professors who teach political science or international relations integrate current events into their classrooms. This is an important part of many of the seminar sessions I hold, for example. However, rather than simply asking the class “What’s in the news today?” or presenting news stories yourself, attempt to fashion these activities in ways that engage students in the process of locating and justifying choice of sources. What I have done in introductory political science courses, for example, is have students research a news story they want to talk about, and, before presenting the story for class discussion, requiring the student to describe to the class which outlet the source is from, and give a few reasons why this outlet should be considered a credible source. This type of assignment forces students to consider these issues before sharing news and analysis in class discussion. 2. Teach Students Skills about Locating Good Sources:There are a variety of good infographics and tutorials on locating good news sources (here and here are examples I teach with, though with modifications). Integrating these into your lecture or seminar periods can increase the quality of current event assignments, and provide students with the tools to find quality news. I have asked students nearly every semester about their news reading habits. Many of them have told me that they would like to be more informed, but that it is overwhelming at times to mediate between so many sources. Giving students suggestions about 3-4 quality news sources they should consider following can be a good starting point for developing good habits of daily news reading. 3. Invite Campus Resources to Come Speak with Your Courses: Many campuses have resources related to media literacy; take advantage of these resources. Some libraries will come and talk to students about doing media research, and may even have resources for students free of charge. The library at my institution, for example, offers students free access to the New York Times online. All students have to do is ask the library for log in credentials. The problem is: many students do not know that this exists at their universities. 4. Use Social Science Research to Show Students How Media Affects Political Beliefs and Behavior: Finally, we can do what we do best as social scientists and educators. Teach students why media literacy matters. In political science, we can spend more time talking about recent research trends related to the effects of the media on the public. Giving students reasons about why media literacy matters in politics creates further incentive for students to engage in more disciplined research into sources. With discussions abounding regarding the role of professors in activism and political engagement on the one hand and neutrality on the other, there are things we can do to better teach students to use critical reasoning skills, know more about the world they are studying, and become better citizens. This does not necessitate partisanship. The wager here is that more informed students will be better prepared to fight, resist, and respond to bad information, bad arguments, and false narratives. Dillon Stone Tatum is an assistant professor in the Department of Political Science and Geography at Francis Marion University. His research and teaching interests are in international relations theory, the history of liberal internationalism, and critical security studies.